Occasional invaders is one term that we use to describe those pests that enter structures periodically, and only under certain circumstances. They are not permanent indoor residents that are able to successfully reproduce indoors. 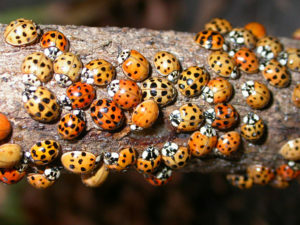 Most occasional invaders are normally outdoor pests. Some are foundation pests found in mulch, woodpiles, and plants around the perimeter of a building (we often call these “perimeter invaders” when they move inside). Examples are earwigs, sow bugs, pill bugs, millipedes, clover mites, springtails, and crickets. They usually move inside when their outdoor conditions change and become too wet, too dry, too hot, too cold, or too crowded. Most are not adapted to drier indoor conditions and die fairly quickly. There’s another whole group of occasional invaders that are sometimes called “fall invaders” or “overwintering pests” because they move indoors when the weather cools and outdoor conditions change in the fall. Their natural habit is to seek sheltered places where they can spend the winter, becoming active again in the spring. Normally these pests overwinter outdoors under bark, in mulch, in woodpiles or tree stumps, under stones, in burrows, and in many other protected places. But, if there’s a nice warm building nearby, that’s an attraction. They are not necessarily looking to get inside that building. Many of them will spend the winter on the outside, under siding, behind shutters or eaves, or tucked in along the roof line. But, if they find an opening that will let them into that nice warm space, they will take advantage and become part of the household. Most of the fall invaders that become pests do so because they enter homes in very large numbers. They are mostly outdoor plant pests that build up to high numbers in nearby fields or orchards during the summer. This group includes the more well known Asian lady beetles, brown marmorated stink bugs, cluster flies, elm leaf beetles, and boxelder bugs. 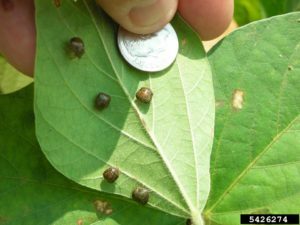 There are also newer and regional fall invaders like the kudzu bug, the western conifer seed bug, and various other seed bugs. Fall invaders that survive indoors will look for a quiet place to spend the winter, ending up in wall voids, attics, behind baseboards or draperies, under carpet, almost anyplace. In the spring, as the days get warmer (or sometimes on warm days during winter), these overwintering pests become active again. They leave their hiding places, sometimes in large numbers, and try to find a way to get back outside. They’re found sluggishly crawling along baseboards or up walls. They’re attracted to light and end up at windows. The time to control fall invaders is before they move inside in the fall by applying a perimeter treatment, and/or treating host plants, and by pest-proofing the exterior. 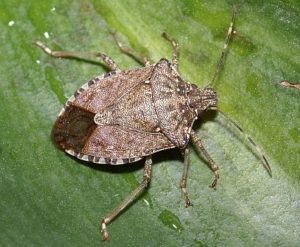 Fall-invading pests can be very regional, especially for those, like the brown marmorated stink bug(it is in GA), that are recent introductions into the U.S. and are still populating new areas. In fact, some of these may not (yet) be in your area, or you may have some fall invaders that are very specific to your area and are not pests elsewhere. Because some of these fall invaders are associated with crops or certain plants, homes near those plants are at higher risk of invasion. Multicolored Asian lady beetle, Harmonia axyridis – Found throughout U.S. and southern Canada. Predator on plant-feeding insects. Size: 1/4-3/8 inch (6-10 mm). Color variable; usually mustard yellow to dark reddish orange, with variable number of black spots and a black “M” shape on thorax. 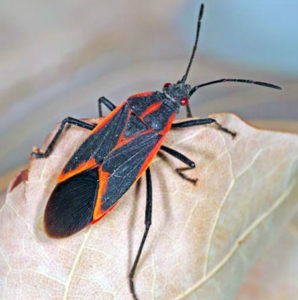 Boxelder bug, Both eastern and western species found in most of U.S. and into Canada. Feeds on female boxelder trees or silver maple trees. Size: 1/2 inch (1114 mm). Color black with red-orange markings along sides, on back, and along wing borders, and red eyes. Cluster fly, Found throughout Canada and the U.S., except states bordering the Gulf of Mexico. Larvae are parasites on earthworms in the soil. Size: 3/8 inch (8 mm). Color dull dark gray, abdomen splotchy gray, golden hairs on body. 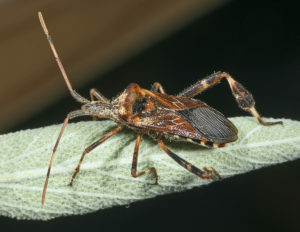 Brown marmorated stink bug Found in 41 U.S. states and two Canadian provinces. Feeds on fruit trees and field crops. Size: 1/2-5/8 inch (12-17 mm). Color mottled brownish-gray with alternating brown and white markings along outer edges of abdomen, and white bands on antennae. Kudzu bug, Found in at least 8 southeastern states. Feeds on kudzu and soybeans. Size: pea size; 1/8-1/4 inch (4-6 mm). Color shiny olive green with brown speckling. 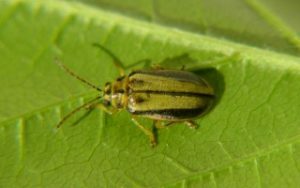 Elm leaf beetle, Found throughout the U.S. Feeds on elm trees, especially Siberian elm. Size: 3/16-1/4 inch (5-7 mm). Color dull yellow to olive green, edged on each side with a broad black stripe, 3 black dots on thorax. If your clothes are drying slow check outside to see if your dryer vent basket is covered with lint!